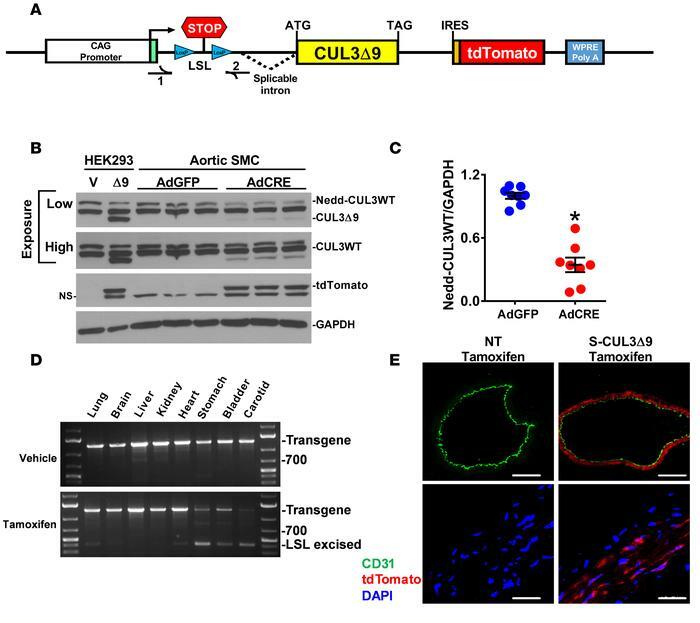 Smooth muscle–specific expression of CUL3Δ9. (A) Schematic of construct used to generate inducible cell-specific CUL3Δ9 transgenic mice. CUL3Δ9 cDNA was generated by overlap splice extension PCR and cloned into a vector, which we previously described (26, 30). (B) Aortic smooth muscle cells (SMC) were isolated from CUL3Δ9 transgenic mice and infected with adenovirus expressing either Cre recombinase (AdCRE) or GFP (AdGFP). The first two control lanes are HEK293 cells transfected with either empty vector (V) or CUL3Δ9 construct (Δ9) to provide a marker for the position of the CUL3Δ9 protein band. A low and high exposure of the same blot are shown to show the decrease in neddylated CUL3WT (top) and the expression of CUL3Δ9 (bottom). This is a representative of 4 independent experiments. (C) Quantification of neddylated CUL3WT (Nedd-CUL3WT) (n = 8). Error bars represent the mean ± SEM. *P < 0.001 by 2-tailed t test. (D) PCR analysis of genomic DNA providing evidence of Cre-mediated excision in smooth muscle–enriched tissues from vehicle- or tamoxifen-treated S-CUL3Δ9 mice. The positions of the transgene and recombined transgene after excision of the lox-STOP-lox (LSL excised) sequence are indicated. (E) Aortic sections from tamoxifen-treated nontransgenic (NT) and S-CUL3Δ9 mice were immunostained for the endothelial marker CD31 (green), stained with DAPI (blue), and were visualized for intrinsic fluorescence of tdTomato reporter (red). Original magnification, ×10; scale bar: 200 μm (top). Original magnification, ×60; scale bar: 10 μm (bottom). NS, nonspecific band; V, vehicle; NT, nontransgenic mice.